Several years ago, I went to a screening of Sweet Home Alabama with a group of friends. In one of the film’s early scenes, when Reese Witherspoon’s dashing beau surprises her with a trip to Tiffany’s to choose any ring she wants, the theater (packed with women) erupted in sighs of ecstasy. Until that moment, I never realized how strong the power of Tiffany’s could be, how that distinctive shade of blue could wreak joyful havoc on the female soul. Melissa Hill examines the peculiar obsession with that one jewelry store in her latest novel, A Gift from Tiffany’s. The book is well-timed, coinciding with the materialistic holiday season, and the plot obligingly begins on Christmas Eve. In the hustle and bustle of last-minute shopping, an improbable accident causes a mix-up of no small proportion when Ethan Greene, an earnest, stiff Londoner loses the engagement ring he just bought from Tiffany’s as it gets switched with a charm bracelet (also Tiffany’s) belonging to an accident victim named Gary Knowles. After Ethan provides first aid and goes about his business, he discovers that the ring is missing. Then, a self-absorbed yet confused Gary discovers that he is now in possession of the ring, and he decides to pretend it was his all along, leading to endless and increasingly tiresome attempts on Ethan’s part to get back his property. Once the accident occurs to set the book’s plot in motion, its continuance depends on the audience believing that Ethan is too meek to fight more actively for his wildly expensive ring because of the sympathy he holds for Gary’s dynamic fiancée, Rachel. To further complicate matters, Hill throws in a number of sympathetic supporting characters, from Ethan’s too-cute-to-be-true eight year-old daughter, Daisy (whose now dead mother once told her that Tiffany’s is “magic,” in Disneyesque style) to Rachel’s protective best friend, Terri, who becomes an increasingly prominent character as the book progresses. While Ethan’s girlfriend Vanessa also figures largely into the plot, her personality doesn’t fully form until the last pages of the book. 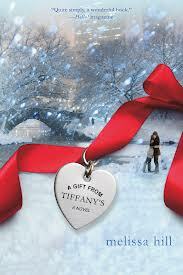 A Gift from Tiffany’s is a pleasant read, but there are a few things about it that might give the reader pause. For one, even though portions of the book take place in America, Hill has a hard time replicating American dialect, even going so far as to refer to one character as possessing a strong New Jersey accent when she sounds folksy enough to hail from more Southern regions of the country. The other Americans in the book speak in strange, stilted ways that don’t sound quite authentic. Aside from that, Hill uses the term “shyster” in one of the dialogue exchanges between two characters who are supposed to be admirable people. Perhaps in Ireland that term is not construed as offensive, but here in America, it is derogatory. Women who worship at the altar of Tiffany’s will enjoy its significant role in the book and appreciate the scenes that involve the store or its products. In addition, Rachel and Terri run a restaurant, so sugar or carb addicts will especially like the scenes that describe Terri’s unparalleled sourdough, or Rachel’s cookie-baking finesse. A Gift from Tiffany’s has plenty of crowd-pleasing fodder in it to keep readers interested; however, the forced nature of many of its plot points make it a little too easy to put down if a real gift from Tiffany’s, or a plate of holiday cookies, happens to be beckoning from the next room over. Miriam Plotinsky is an English and creative writing teacher. She lives in the DC/Metro area with her husband and three kids, who occasionally give her the time she needs to write and eat sushi.